Assetware Manager is a comprehensive and flexible fixed asset software solution. 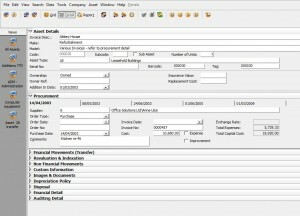 Assetware Manager allows users to create, maintain, track, account and report on their capital and inventory assets. Designed by accountants and asset managers; Assetware Manager reduces the time and effort associated with managing your fixed assets. Assetware Manager is accredited by the ICAEW, and fully supports, IAS, IFRS, GAAP, GRAP and Sarbanes-Oxley accounting practices and process requirements to name but a few. A scalable and configurable product. Assetware Manager allows for complex organisational structures and processes. Quick and easy installation, including a straight-forward data migration from existing systems. Supports multiple currencies, multiple companies and multiple books. Automated capitalisation threshold can be set up, allowing for inventory items to be kept separate from capital items. Component Accounting, Grant recognition and Current Cost Accounting. All the standard financial reports required including Statutory, Management and Journals. Past, current and future reporting options. Reports are quickly generated for the active period/year, historical and future periods. All events contain their own audit records. Full report customisation, if the data is there it can be reported. Direct export to numerous file formats including Excel, PDF and HTML. Drill down facilities and graph analysis options. Detailed asset information and transaction events. Capital and Expense assets recorded in full detail. Numerous standard depreciation methods and user defined options. Apportion depreciation charges across multiple departments and cost centres. Asset events are recorded in detail creating an easy to use and see audit trail. Bulk operations using the Data Gateway, such as additions, transfers, disposals, asset re-lifes and more, allow for easy mass transactions. Full or partial asset disposals and transfers. Image and document storage for each asset record. 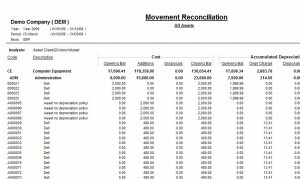 Multiple invoices per asset record. Invoices are recorded against the asset and identified as capital, expense or improvements. This also includes credit notes. Integration to other software packages such as accounting, facility and information technology applications. Views are used to interrogate the database. The application provides system views based upon the company structures, user defined views allow for assets and reports to be easily filtered. This is just a snapshot of the capabilities of Assetware Manager. To learn more and to see how this product can satisfy your organisation’s fixed asset management needs please contact us on +44(0) 870 112 0700 to discuss your requirements in more detail.